Many of you have said that you “miss seeing my smiling face around lately”. Well, that’s because I have been busier than usual running around the state finding lab locations, hiring lab operators, travelling with sales reps, and making sure these newly certified labs have business coming through the doors. As I mentioned in last quarter’s newsletter, we recently opened the Plymouth, New Castle and Carmel locations. By the end of April we will also have locations in Lafayette and New Albany staffed with lab operators to run your Microbiological samples and route drivers to provide a pick-up. And, between you and me, there are hopefully at least 3 more opening in Central Indiana by year’s end. I truly wish I could clone myself in times like this (although some may think it’s scary to have more than one Laurie Webb on the streets at a time). It’s very exciting and it’s leading to great business opportunities for ELI. I’m sorry if I have not been able to stop in and say HI, like I used to, but if you need me for anything, please don’t hesitate to call and I will still bend over backwards to offer the customer service you have experienced since I started 14 years ago. One last note…I will be taking a much anticipated (and much needed) vacation from April 30 â€“ May 10, so if you need anything, please contact the lab in Madison at 888-932-6699. Time is flying; we are now in the 2nd Quarter of 2012! Our certifications in both Indiana and Kentucky continue to allow us to offer a wide range of drinking water testing to clients throughout both states. Spring/summer is always a busy time for us, and the season is fast approaching. However, this spring/summer promises to bring us an EXCEPTIONALLY large number of samples for drinking water testing – SOC , VOC, IOC, TTHM & HAA5, copper and lead testing – and as usual our well-seasoned laboratory/office staff is up for the challenge. I’m sure that some of you are ready for your next shipment of bottles, so if you have an established bottle delivery schedule with us, your 2nd quarter drinking water bottles will be sent out by April 15th. As for all of our Summer pool clients, you should expect your bottles at least one week prior to Memorial Day Weekend. Now, if you’re one of those few clients that have yet to set up a bottle shipment schedule, and you prefer to call on an “as-needed” basis, we’re here to help you in any way we can, just don’t wait till the last minute to order!! We’re in the process of opening two more labs in New Albany and Lafayette to better serve our clients; the addition of these two new laboratories, along with our other three established satellite laboratories – Plymouth, New Castle, Carmel – will bring us to a total of 5 satellite laboratories throughout the state of Indiana. 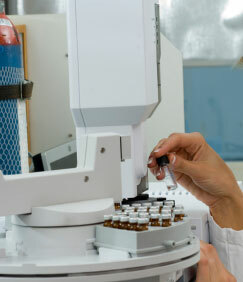 Besides providing testing services, each of the professional laboratory operators, at our satellite labs, have the ability to provide sample collection and well treatment (chlorination) services in each of their respective geographic locations. We encourage you to contact us should you find that you require any of the aforementioned services. The expansion of our labs for sample preparation and waste water/solids analysis is underway so that we might better serve our clients in testing for organic contaminants in waste water and solids; in the very near future, we will have the capabilities to test for contaminants in both volatile and semi-volatile organic samples.